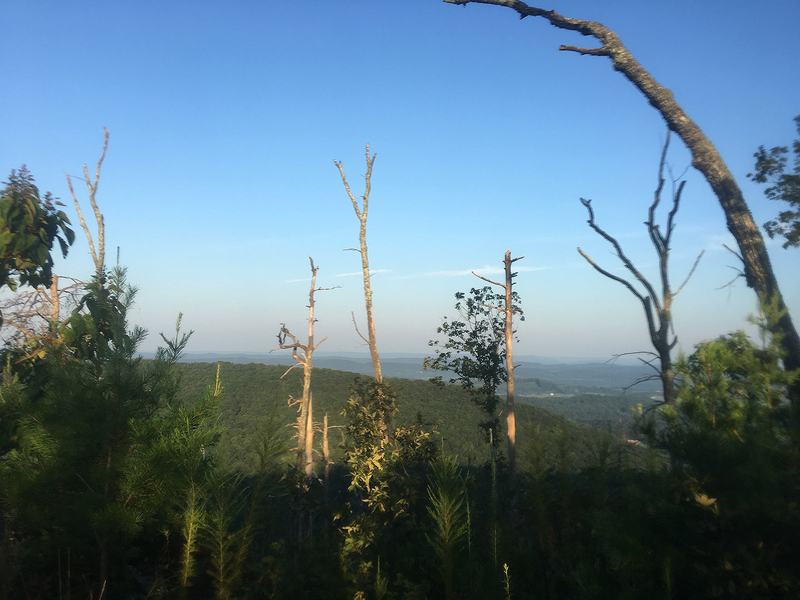 Saturday I ran my longest trail run ever, a preview run for the Georgia Jewel on September 23, 2017. The largest jewel in this event’s crown is a 100-mile course. There are also 50, 35, and 17-mile options. Technically, this year is my “less than 25K distance” year because training for this distance consumes all the extra time I have available so I don’t use already-limited family time away from our adorable little circus. For this race, though, I made an exception (and Meghann graciously agreed) to reach 27K mark so I could run this particular race. This will be my second trail race ever, first one with a 1° wind chill in early January of this year, also in North Georgia at Cloudland Canyon State Park where I finished 14th overall and finished first in my age group. That’s where I became officially hooked on trail running. There is a high concentration of epic trails in the greater Chattanooga and North Georgia area, far more concentration than we have in Middle Tennessee though the ones we have are pretty great. Still, it’s a completely different kind of trail than what is found in North Georgia and Chattanooga area. Given the driving distance between Nashville and these trails, I have to be very selective on which trail races I enter. Long trail races require more time away from family than the same distance on the road, but there was something about Georgia Jewel 17 miler that spoke to me…distance was easily trained for, driving distance was manageable, great race directors, solid turn out of talented runners, cool swag, beer, pretty much everything that makes for a killer trail race. Plus our calendars were open enough to allow it to happen. In order to add to the adventure level, I opted to car camp at the starting line staging area instead of booking a hotel room. And what an adventure experience that became. After spending almost an hour rushing down the interstate, I exited I-24 at Manchester, TN to travel the two-lane Hwy 41 scenic route to Chattanooga so I could enjoy the countryside with windows rolled down, music playing beneath blue sky with white puffy clouds and cooler-than-usual temperatures for mid-August. Pretty much everything that goes into an epic road trip, except that my Everbride was not with me like she had been previous epic road trips. Three kids under eight at home with one of those a 2 1/2-year-old boy means our epic road trips have been sidelined in recent years. Hopefully next time though. After finding my parking spot to car camp around 10:45pm, a dark parking lot atop a hill with just enough light coming from nearby city to gently illuminate the parking lot without drowning out the Milky Way and constellations which were very visible overhead. Lady Luna was but a mere sliver beyond yonder hilltop as she was only two days away from renewing herself. I chose this spot because it’s much easier to sleep in the dark than under a bright lamppost; however, it also enhances the adventure a notch or two. OK, maybe three notches. The only human for two miles around…this could get interesting. So I settle in after prepping food/fuel for tomorrow’s trails. Temperature outside is around 75° with a very slight breeze, so I lowered all four windows about 3–4 inches for ventilation inside the car and also so I would be able to sleep safely inside the turtle shell of my car and hear if someone else drove into the parking lot. Time is now 11:00pm on a Friday night, two hours past my regular bedtime for this early-riser. Normally I am able to fall asleep within seconds–literally, seconds–but tonight was different. My GPS running watch has a built-in heart rate monitor that measures my heart rate during a run, and it also displays current resting heart rate. Typically my bedtime resting heart rate is in the low 50 beats per minute. Tonight my watch read 75 bpm and relaxation attempts to lower that heart rate were unsuccessful. Minutes go by. Then 10–15 minutes. Then 30 minutes. Still not asleep. Remember, falling asleep usually takes a matter of seconds for me. And I need some sleep for tomorrow’s trail run. But I’m also on this solo car camping adventure, so I suppose I was a little excited, a wee bit anxious about safety, and also out of my normal element. I sought adventure on this trip, and adventure found me. Shortly thereafter, I hear tires popping-up gravel across the parking lot. Then headlights and a search light shine directly into my windows. Then the super-bright end of a flashlight. The state trooper was quite professional as he introduced himself and inquired about why I was parked in this unlit parking lot. “I’m meeting some friends for an early morning run here and thought I’d get a little shut eye,” I replied. He asked for some identification which I offered–sleepily recalling from foggy memory where I put it then fumbling through the dark to locate it–through the open window slit. When he returned with the all-clear, he informed me that Dalton Police Department may also be around sometime overnight. Silently wondering “could you radio DPD to let them know you’ve cleared the navy blue car parked in the dark atop this hill so I could remove one potential sleep interruption?” but I decided to leave that question unasked so as not to appear like I was hiding something. Police have a job to do, and I had nothing to hide. Plus…it’s a practically pitch-black parking lot so repeat police presence is like having my very own security detail. “Enjoy your run,” the trooper said before slowly driving away. Commence another attempt to enter Sleepytown. Resting heart rate now 78bpm (+50% from my normal bedtime heart rate…+50%!). Could be a long night. At some point, I actually fell asleep to then be awakened by a second car with headlights shining into my windows. Thinking this could be DPD, I ultra-sleepily raised my hand (couldn’t raise my head or body) and waved as if to say Hi, DPD officer, I’ve been expecting you. All is well. Just sleeping (or trying to). There’s nothing to see here. Thank you. And the car drove away with no conversation or interaction. Somewhere in my car was the Easy Button, and I drifted back to sleep. A third car approached with lights a-blazing, including another ultra-bright flashlight which this time illuminated a shiny badge of…DPD. Similar friendly, conversational encounter but without the ID check. He mentioned that a car he was following “got away from me, and I thought I’d check up here” then he said good night and drove away, scanning the tree line with his search light as he descended the hill. Then a reality dose kicked in. Who was in that second car? What were their intentions? Will they be back? NOW it’s an adventure! Grateful for my fellow car campers Wesson and his close friend Smith, but I really didn’t want to wake them. That would be worse than making Bruce Banner angry (that’s who The Incredible Hulk is, by the way). Instead, I downloaded a local police scanner app to keep my ears open for law enforcement radio chatter in hopes of being alerted to anything related to the whereabouts or developments of that mysterious second car. For the next 30 minutes, I was grateful to learn only of some accidental overdose 9-1-1 house calls and chatter on the police scanner. Saddened for those locals but, if I may be a bit selfish in this instance, still slightly irritated that I was jolted away from Sleepytown (again) when my planned wake-up call was now a mere three hours away. Somehow the next 2 1/2 hours flew by…SLEEP!…because I actually felt a bit rested from the power nap, only to be awakened by slow rolling vehicle traffic of the first group of runners who arrived at 4:30am to run an out-and-back route, doubling the mileage the rest of us had planned that morning. With only 30 minutes remaining until my wake-up call, I decided to ease into that wake time and head downhill to town for breakfast and an actual restroom before heading back uphill to meet the group of crazies with whom I’d run through the woods at 6:30am for a continuation of this adventure. Few mornings have I been more grateful for the sunrise than this particular morning. 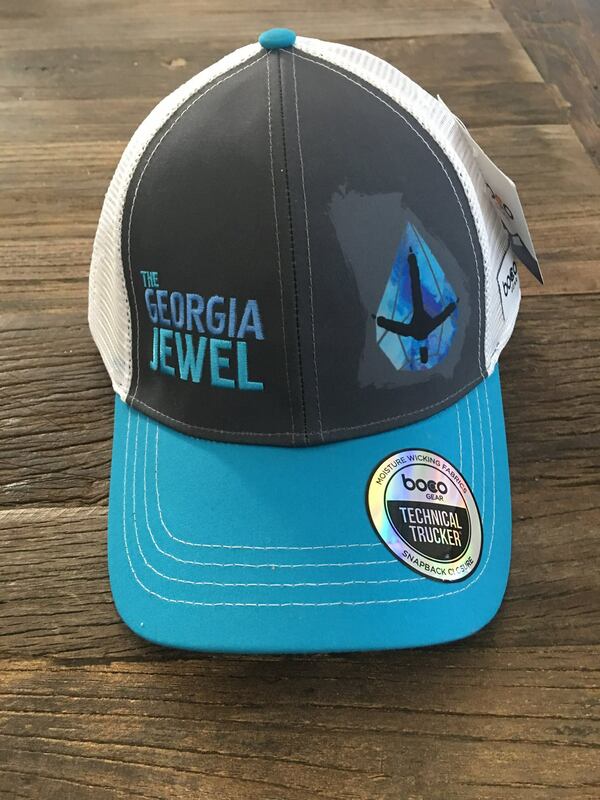 My verbosity is showing, and we haven’t even reached the trailhead yet so I’ll summarize from here by saying the Georgia Jewel race day will be fantastic. What a great time making new friends on this race preview training run over 17 miles of the Pinhoti Trail, up and down then up again and down again then up one more time and down one final time over three ridge lines and several rock gardens on this rated “difficult” hiking trail for my longest trail run to date. Excellent day in the woods with great company that ended in a strong finish. Who was in that second car? I’ll never know. But I’m glad they drove away. Adventure sought. Adventure found. Here’s to the next one.